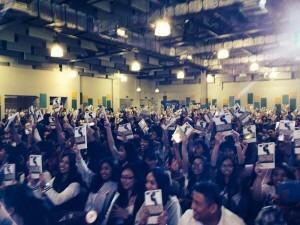 February 1, 2014 marked our biggest discipleship event of the year: Discipleship 2014! 8,959 current and upcoming Victory group leaders from our fifteen Victory locations gathered as one church in Metro Manila to be equipped and empowered to reach the next generation for Jesus. For the first time ever, Discipleship 2014 was held simultaneously in all our Metro Manila centers, all the way from Alabang, to Quezon City! Pastor Steve Murrell delivered a message about building foundations. Gleaning from the story of the Apostle Paul, Pastor Steve shared how we can be established in the Word, the church, and our faith. He also emphasized how practicing God’s Word builds foundations in our lives, enabling them to become storm-proof. More importantly, each Victory group leader was reminded that “Jesus is the foundation.” Indeed, He is the Rock on which we stand! Our Victory group leaders learned about iLead, a really easy way to remember how to develop leaders. This process encourages leaders to identify, instruct, impart, and intern their Victory group members, training them to do the same to others. Our Victory group leaders were also invited to participate in our ongoing Every Nation Building Phase 2 Project. Our senior pastors cast a fresh vision of training leaders and transforming nations in the next twenty-five years and beyond. Finally, our Victory group leaders received a free copy of Pastor Steve’s new book “100 Years from Now,” which explains the importance of understanding the mission, values, and culture. After Discipleship 2014, we’re excited to see more Victory group leaders activated to honor God and make disciples! To all our Victory group leaders. thank you for locking arms with us as we share the gospel in our families, communities, campuses, and offices!